Being the best pizza in San Francisco is no small feat, especially when you are known for deep dish pizza. Ask anyone in San Fran for their favorite pizza and Little Star Pizza is ALWAYS mentioned. The first thing to know if you plan on taking the trip to have some of their heavenly pizza is they are closed Mondays. Next understand the wait can be long and the parking can be terrible, but it's worth it! A 2 hour wait is not uncommon. Once inside expect your pizza to take up to 30 minutes as well. And lastly a deep dish pizza for 2-3 with a topping and a couple of drinks will run you approximately $35. So why would anyone do this? 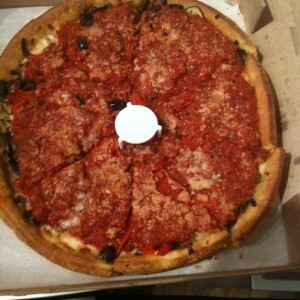 Like I said its the best deep dish pizza in San Francisco - that's why. So lets talk strategy and then we will get to the pizza and its secrets. Going to Little Star requires a team effort. To start, have the driver drop off the passenger(s) and have them go in to get your name on the list as this will limit your wait time tremendously. Go for the DEEP DISH Pizza ONLY! This is what they are known for primarily. Thin slice folks will be disappointed otherwise. Next order an appetizer because as I said the pizza takes at least 30 minutes to cook!! Next when ordering a pizza at Little Star know that 1 pizza can feed 3 people - so true so don't over-order, unless you want leftovers. Now onto the pizza. The pizza is tasty without sauce running, as well as garlicky.The secret here is the cornmeal crust which is absolutely awesome, but also quite filling. The ingredients are fresh and flavorful, and not overpowering. The crust is DELICIOUS leaving you wanting leftovers. As for Little Star it really has become a San Francisco destination for many just be wary of the long wait and the fact that the place can get pretty loud at times. If you can deal with that you will be rewarded with some great deep dish pizza. Little Star Pizza gets 7 out of 8 amazing slices.